E-minis are electronically traded futures contracts that represent a faction of the value of a corresponding standard futures contract. Because e-minis offer round-the-clock trading, low margin rates, volatility and liquidity, they are ideal trading instruments for active traders. The first e-mini contract – the e-mini S&P 500 – was introduced by the Chicago Mercantile Exchange (CME) on September 9, 1997. The value of the full-sized S&P 500 contract had become too large for most small traders, so the e-mini was created to make futures trading accessible to more traders. It quickly became a success, and today there are e-mini contracts that cover a variety of indexes, commodities and currencies. The e-mini S&P 500, however, remains the most actively traded e-mini contract in the world. This guide introduces e-mini futures contracts and covers e-mini characteristics, popular contracts and contract specifications, plus important e-mini concepts like margin, leverage, volume and volatility. 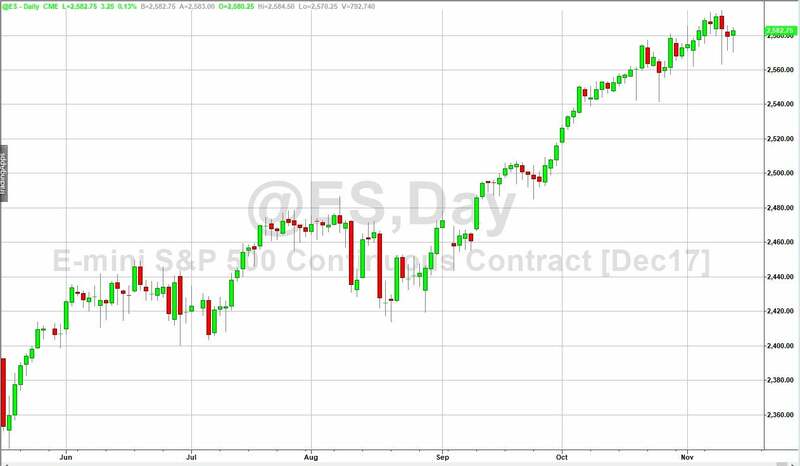 A daily chart of the e-mini S&P 500 (ES) stock index futures contract. Image created with TradeStation. Deciding which markets to trade can be complicated, and many factors need to be considered in order to make the best choice. Learn how.